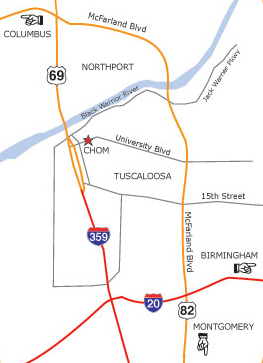 CHOM is located at 2213 University Blvd. in downtown Tuscaloosa, next to City Hall. Some items are better left in the car. No weapons of any kind are allowed in the museum. No food, drink, or outside toys are allowed in the museum. Baby bottles are currently allowed; sippy cups are not. A limited number of free lockers are provided to guests for food, sippy cups, water bottles, toys, backpacks/bags and personal belongings if they wish to use them. Backpacks/large bags are not allowed in the exhibits. Guests arriving with backpacks, bags, and stroller bag storage will be asked to open them before being admitted. Bags and belongings may be stored in one of the free lockers provided. If you do not wish to open your backpack/bag or leave it in a locker, you will be asked to take it to your car. Shoes must be worn in the museum. Waterproof diaper coverings must be worn over cloth diapers, disposable diapers and over brands such as ‘Thirsties’, ‘Bum Genius’, ‘Easy Ups’, etc. A Nursing Nook is located on the Lower Level for those who wish to use it – just ask at Admission Desk for the key. A number of fast food and fine dining restaurants are located near the museum and are either within walking distance or a short few blocks drive away. Also, River Road Park and Capitol Park have picnic facilities available. Outside food and drink are not permitted inside the museum. Although we offer exhibit experiences and many programs for our very youngest guests, we are unable to permit food and drink for this age within the museum. CHOM is open Monday – Saturday 9 – 4:30pm. The museum is closed Sundays and all major holidays. Please call the museum before visiting on major holidays or check our website calendar for details. Take I-59/20 west toward Tuscaloosa. Take exit 71 B, which will put you on I-359, heading north. Continue on this road until you reach University Blvd. in downtown Tuscaloosa. Do not go over the bridge. Turn right on University Blvd, and go approximately 3 blocks. CHOM is located on the right. Take 82 west into Tuscaloosa, where it becomes McFarland Blvd. Continue on McFarland Blvd. until you reach the exit for University Blvd. That exit will put you on University Blvd. heading west. Continue on University Blvd. through the University of Alabama campus into downtown Tuscaloosa. The museum will be on the left. Take 82 east into Northport. At the intersection of 82 and 69/43, turn right onto 69. Continue on 69; you will cross the bridge and come to the intersection at University Blvd. Turn left onto University Blvd. Go approximately three blocks and CHOM will be on the right.